Colin Funk plays Houdini in a revival of the 1997 musical about conjoined twins Violet and Daisy Hilton, Side Show, now playing at the Porchlight Music Theater in Chicago. Houdini's role isn't a large one -- Funk also doubles as The Dog Boy -- although he does appear in at least one musical number, "Come See a New Land." 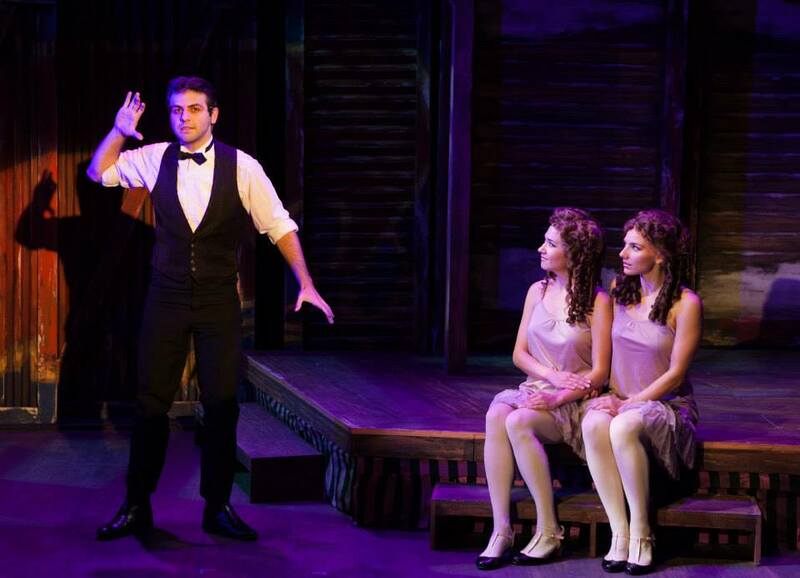 Below is a photo of Funk's Houdini with Colleen Fee and Brit-Marie Sivertsen who play the Hilton sisters. Tony Award-nominated for both "Best Score" and "Book of a Musical," Side Show is based on the true-life stories of the legendary Hilton twins, Daisy and Violet, and their search for love and acceptance amidst the spectacle of fame and scrutiny under the spotlight of public opinion. Set against the backdrop of 1920s and '30s show business, Side Show seamlessly blends the worlds of carnival, vaudeville and Hollywood glamour in a haunting and sympathetic story of extraordinary humanity. In reality, as in Side Show, Houdini did meet Daisy and Violet Hilton. The sisters credited Houdini with teaching them to find individual privacy; the story goes that Houdini put the pair under hypnosis, teaching them how to "get rid of each other," in their words. The twins’ discuss Houdini fondly both in interviews and in their autobiography. Side Show opened September 11 and is now extended through October 25. Click for times and tickets. I saw this revival of SIDE SHOW when it came to Broadway a few years ago, and the introduction of Houdini was a nice enhancement to the script (the character did not appear in the original 1997 production). The other side show characters were much more vividly portrayed in the revival and they gave a sympathetic and compelling depiction of the kind of people Houdini would have encountered in his side show days. Unfortunately, the show only ran a couple of months despite excellent reviews.